For players that dream of Chow Mein and Chop Suey as they spin the wheels, Slotastic! introduces the new Wok & Roll slot machine that serves up lots of chances for free games and has two jackpots on the menu to spice things up. The new online slot machine is the Slot-of-the-Week this week at the US-friendly online casino which means players can get up to $100 free to play the delicious new game. To make the fun last as long as possible, "Wok & Roll" and “Chef” symbols award up to 12 free games. Wok & Roll also has two big prizes, a Minor and a Major Jackpot, that increase in value with every bet until they are won. Neither has an upper limit. 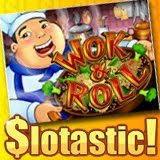 Players can try Wok & Roll for free or wager real money. Although Slotastic! has a selection of instant-play slot machines, Wok & Roll is initially available in the download casino only, along with the full selection of more than 300 slot machines and table games. With new slots releasing virtually every week since it launched, Slotastic.com players are never bored. But what’s really got players talking is the massive jackpot pool that’s accumulated. The Jackpot Pinatas progressive jackpot alone is worth more than $1.5 million and there are several other games with 7-figure jackpots that have been alluding players for months. Until the end of January, in addition to their Slot-of-the-Week bonus, Slotastic! players can also claim the $100 Progressive-of-the-Month bonus and get another $100 to try their luck at the $1.5 million Jackpot Pinatas jackpot. Terms and conditions of all casino bonuses are posted in the ‘Promotions’ section of Slotastic.com.